Personal interview or commonly known as PI during MBA admission process, always remains subjective to some extent albeit over a period of time institutes have added percentage along with Essay writing, Extempore Speech or GD before that and even academic record is also seen as backgrounder to individual personality. Basically PI is to judge the overall personality of aspirant duringadmission process. What’s that can be important for aspirants? Keeping this in mind team MBA Rendezvous conducted a poll among some successful candidates of last year. 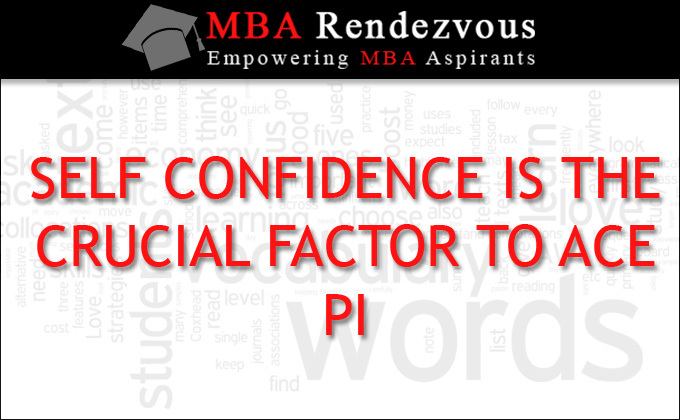 With the outcome of MBA Rendezvous poll , it has been revealed that confidence is the crucial factor which needs to be nurtured to ace PI. One hundred twenty two respondents in poll were asked question that what’s that which you think is most relevant for PI ? Besides confidence, oral communication skills are also major factor which helps candidates to remain confident whereas conventional thinking that gestures have some meaningful communication is of passé. Yes, positive attitude and positive body language still might give you advantage to boost your confidence. All said and done, PI for those who are likely to take MBA entrance exams in 2015 is far away but since soft skills nether can learnt nor improved overnight, perhaps time is equally ripe to get on to this very crucial area and start practice along with preparation of exams.